ECO Sleep Solutions, Inc. proudly showcases platform bed frames and other bedroom furniture made in Eugene, Oregon by Pacific Rim Woodworking. Since 1981, Pacific Rim Woodworking has offered hand-crafted, solid maple furniture at affordable prices in Eugene Oregon. They have recently added cherry wood to their line. To highlight the natural beauty of these distinctive hardwoods, they hand-rub each piece with their own finish. Enduring quality and simple elegance are the hallmarks of their contemporary American style. The folks at Pacific Rim Woodworking are committed to producing a quality product with minimal environmental impact. Pacific Rim Woodworking uses traditional woodworking methods such as mortise and tenon and dovetail. They use an oil-based finish on all their furniture. We have many of their platform bed frame styles in our showroom. And since they are an Eugene-based company, your purchase not only supports responsible harvesting practices and handcrafted quality, but it also helps support the local economy. ECO Sleep Solutions, Inc. also carries other fine western maple and cherry bedroom furniture from Pacific Rim Woodworking. Along with other furniture, they also make baby cribs, writing desks, nightstands, dressers, and handy under-bed drawers. We have many of these pieces in our showroom, so stop by and see for yourself the high quality of this locally made furniture. Urban Woods furniture is made hand-made from reclaimed wood from old Los Angeles area vintage buildings. The hard-to-find, old growth timber from these buildings is rescued from the waste stream and used for their furniture. Finished with low VOC, water-based materials and water-based, non-toxic stains, they also feature solid wood construction. Besides modern platform bed frames, Urban Woods also carries a full line of furniture. Their exclusive use of vintage reclaimed wood has many advantages. The grain of the timber with its tight growth rings shows the superior density of the wood from ancient trees, and the natural, aged patina and color of the old-growth timber is preserved in the manufacturing process, giving the furniture a look and feel that can not be replicated in new wood. Much of the reclaimed wood was originally harvested and milled 50 to 100 years ago, and has been seasoned in sunny Southern California for decades, giving the wood unparalleled stability and resistance to future distortion or structural movement. 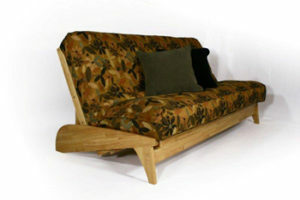 Urban Woods strives to make beautiful, eco-friendly furniture in the most sustainable way. They do not use tropical hardwoods which deplete the rain forest. Finished with low VOC, water-based materials and water-based, non-toxic stains. Only solid wood construction. No use of MDF or particle board. Only water soluble, formaldehyde-free glues are used. All woods are reclaimed from local sources in Los Angeles, reducing forest clear-cutting, landfill use and air pollution. No trees are harmed in the manufacturing of these products. 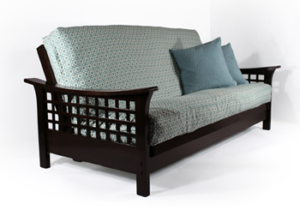 Strata Furniture are makers of high-quality futon frames. We promote their Carriage Collection, which is made from the same wonderful rubber trees that give us natural rubber latex. When the trees are tapped-out after about twenty years of latex production, they are then used for this furniture. The wood is certified environmentally-friendly by the Malaysian Timber Council. Rubber wood, Hevea Brasiliensis, is a very strong wood with nice grain character. It is easily controlled for kiln drying and is quite stable and has great finishing ability. Strata Furniture makes futons with its unique wall-hugger design that allows the futon frame to stay in place as the bed is lowered- no more struggling to pull the frame away from the wall to turn the futon into a bed. Their frames are offered in several beautiful non-toxic finishes and are made with quality craftsmanship. The Carriage Collection offered here continues Strata’s tradition of stylish frames with unique designs. These frames incorporate the same patented front-loading, wall hugger technology. The hidden hardware, wide variety of finishes, and sturdy construction make their frames unequaled in the marketplace. Strata Furniture futon frames are built at a quality manufacturing facility according to rigid standards and quality control procedures. They use certified sustainable-forested first grade plantation-grown Rubberwood. Each product not only looks great and operates smoothly, but is also extremely well built. Strata Furniture frames are well-known for their strength and construction. Design, Function, Style! Their futon frames are simply the best. Maple Corner Woodworks are makers of fine maple, cherry and walnut furniture and platform bed frames. Their Shaker and Harvestmoon styles are endowed with a straightforward and delicate design. They pay special attention to grain matching and wood color. They have high standards for everything from the action of a drawer or to the satin-like feel of their chest tops. Maple Corner Woodworks- the way furniture used to be made. The Green Mountain state of Vermont is home to a long and skilled tradition of woodworking and furniture making of the highest standards. This adage still holds true. Maple Corner Woodworking employs highly skilled woodworkers with a deep dedication to quality and refinement in furniture building. Maple Corner Woodworking believes in harvesting wood in a responsible manner to preserve forests for future generations. Whenever possible they buy wood and support organizations with this goal in mind. This is a part of the Vermonter mindset going back generations. It includes a deep respect for the land and trees that makes this state so unique in our country. They have worked with hardwood brokers and sawmills for decades, establishing close working relationships with those intimately involved in forest management and sustainability. The base finish in all our furniture is a non-toxic, zero VOC (volatile organic compounds) Danish oil based on the carriage oils of the 1800s. It is a linseed oil based finish. We augment higher-wear surfaces with polyurethane oil that cures completely before leaving our shop. We carry two organic mattress foundations by Savvy Rest and Nature’s Embrace. They both consist of an extra-sturdy, untreated pine frame covered with the same organic cotton and wool casing found on their respective mattresses. Come see them in our showroom. 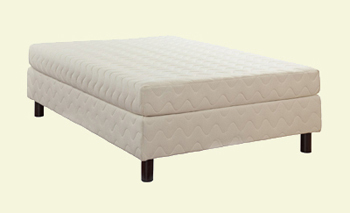 They both can provide a matched-set look, and their slatted foundations are specially designed to provide valuable air circulation to the latex foam mattress. The Savvy Rest foundation is designed to be supported by the bed frame, while the Nature’s Embrace can also be a stand-alone unit as shown in the photo. If you have a bed frame that normally accommodates a box spring, a foundation simply replaces the box spring. The Savvy Rest model is available in a standard nine-inch height or a low profile five-inch height. Both foundations come in all standard bed sizes. King size foundations always consist of two halves, so they fit through doorways, and queen sizes can also be made of two halves when requested. A new foundation enhances the performance, life-span and comfort of the mattress. Consider that if your old mattress is worn-out, then so is its foundation, and money spent on a foundation will extend the life of the mattress. We promote its use in several ways. 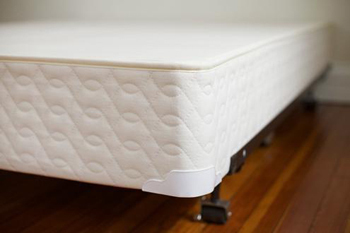 First, it is used inside some of our organic mattresses. They use coir where other mattresses use cotton batting. Cotton batting retains moisture, provides little or no ventilation, and so is a haven for dust mites and other allergens. 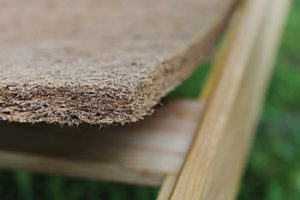 We promote coir as a layer of ventilation when customers wish to keep their mattress directly on a solid surface like plywood, flooring, or other substrates that do not provide adequate ventilation. We also recommend coir as a way to reduce the firmness of futon-style mattresses. It can be placed underneath a very firm futon mattress to provide extra cushion. We strongly suggest that when coir is in direct contact with a mattress that a layer of natural fabric, like cotton, be placed between it and the mattress. An old sheet can be used. Otherwise, it may stain the mattress and may also abrade the mattress because the coir is rough-textured. Our coir is made of one-inch-thick layers. In some situations, two layers may be suggested. Filled with silky, organic kapok, this pillow offers luxurious softness and maleability. 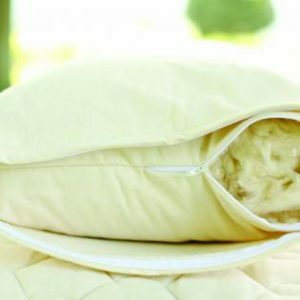 Pillow is overstuffed so you can remove fill and create your own personalized fit.